Honey crinkle cookies. Photos by Jessica Halfin. Cookies are almost always a good dessert choice when baking for a crowd. They’re not too fussy, and one batch can easily feed a bunch—a strength in numbers that makes for an impressive display on any holiday table. 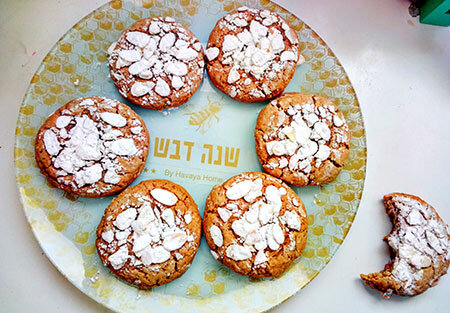 Paired with a cup of tea at the conclusion of your Rosh Hashanah meal, they are a sweet end note without being too decadent, and most cookie recipes are simple enough to allow you to focus on main-course preparations. Likewise, when I’m a guest and asked to bring something to a holiday meal, I usually show up with cookies in hand. They travel well, so much better than cakes that may sweat in transport—icings, frostings and creams smudging. One year, an ill-fated ganache-covered cake cracked in half, straight down the middle, when our car hit a speed bump just minutes from our destination. But this year I decided to change things up, and created a cookie version that mirrors the same flavors of a good honey cake—sweet nectar, sharp whiskey, slightly bitter coffee, bright orange and warm spices. Since I brush my honey cakes with warmed honey and top them with sliced almonds, these cookies received a similar topping, minus the honey. Switching out honey—and rolling the wet dough in powdered sugar before baking—results in an appealing crinkle cookie. If you are making these in advance and plan to freeze them, top with the sliced almonds before baking, then either sprinkle with powdered sugar just before serving, or decorate with a simple light glaze of powdered sugar and a couple of teaspoons water or orange juice, mixed up until thin enough to lightly drizzle over the cookies with a fork. If honey isn’t your thing, how about pomegranate? 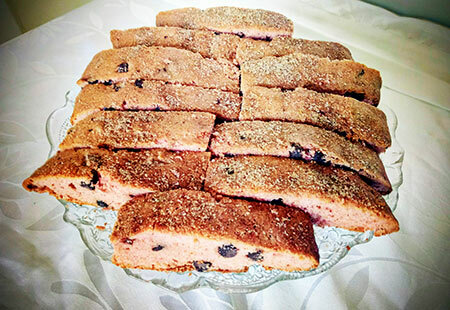 Growing up, Rosh Hashanah always included a gigantic batch of cinnamon-sugar-topped cherry or chocolate chip mandelbrot. 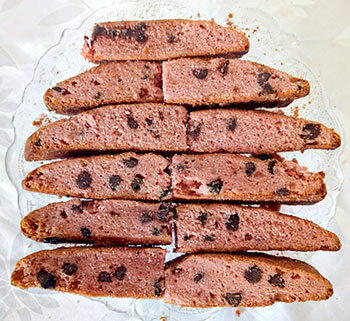 My mother would divide the batter of a single batch into three parts: One part would feature chopped-up maraschino cherries mixed throughout, and two parts were chocolate chip, stained a light pink from the addition of syrup from the jarred cherries. Each year, I try to recreate this pinkness, but never get it quite right. Candied cherries in Israel are not packed in the same type of syrup as in the States, and the boxed cherry juice available here never seems to work. But in my quest to incorporate more pomegranate into my desserts—a popular symbol of the holiday in Israel that rivals the centrality of apples and honey in America—I found a worthy contender. Adding fresh-squeezed pomegranate juice (or non-sweetened jarred juice) to mandelbrot is truly transformative, making my chocolate and pomegranate mandelbrot a suitable Israeli update to my mother’s beloved cookies. L’shanah tovah, and happy holiday baking! This cookie has a wet, cake-like batter. Traditionally, crinkle cookie recipes require the batter to be refrigerated before baking, but I have an aversion to starting a baking project and then waiting a half hour for something to chill before I can move on. This batter is engineered to be baked as soon as it is formed. Dress these cookies up as you like, the crinkle happens in the oven—powdered sugar or not. Preheat the oven to 350 degrees. Fit two baking trays with parchment paper and set aside. In a medium bowl, combine the powdered sugar and slivered almonds; set topping aside. In a medium bowl, whisk together the flour, salt, baking powder, baking soda and ground spices, and set aside. In a mixer bowl, beat together the butter or margarine and brown sugar. Spray a one-cup dry measuring cup with cooking spray, and fill 3/4 of the way with honey. Pour honey into the mixer bowl, and mix to combine. Add the egg, vanilla, orange juice, whiskey and espresso powder, and beat to combine. Scoop out the cookies one at a time using a 1/4-cup spring-handled ice cream scoop, or with two spoons. Hold each cookie over the bowl with the slivered almonds and powdered sugar, and press a generous amount of the mixture (about 2 tablespoons) on the top of each cookie. Place on the tray and flatten slightly, reattaching any almonds that might have fallen. Bake for 12 minutes, until golde, and cracked in appearance. I have taken the liberty of adding a few drops of red food coloring to the batter, but this is entirely optional. Preheat oven to 350 degrees. Fit two baking trays with parchment paper and set aside. In a small bowl, mix together the cinnamon-sugar topping and set aside. Prepare a small bowl with a bit of water and set aside as well. In a medium bowl, whisk together the flour, baking soda and salt, and set aside. In a mixer bowl, beat together the butter or margarine and sugar until fully incorporated. Add the oil and mix to combine. Add the eggs one at a time, beating thoroughly between each addition. Add the pomegranate juice and almond extract and mix until just combined; add the flour mixture and mix to combine. Add the red food coloring one drop at a time to get a light pink hue (if using), then add chocolate chips and stir to combine. Tip out half the mixture onto one baking sheet, and the other half onto the other. Using slightly wet hands, shape into a long thin rectangle, or loaf shape. Sprinkle with about two tablespoons worth of the cinnamon-sugar mixture. Bake for 20-22 minutes. Let cool completely before cutting into thick strips. Each large cookie can be cut into two to yield the amount specified in the recipe. In the crinkle cookie recipe, when do you combine the dry ingredients with the wet? Before or after step five? In most cookie recipes, the mixed dry ingredients are added to the wet ones after the wet ones are mixed (after step 5). Don’t over beat when the flour is added or the cookies get tough. Step 5.5: Stir in dry ingredients just until combined. I would also note that in each recipe the butter or margarine should be brought to room temperature before using. In Step 7 in the mandelbrot recipe, shaping the dough with very lightly floured hands is much easier and less messy than using wet hands. There is also quite a bit of spread and at the 10 minutes mark, when I just rotated the pans, the loaves look more like elongated pancakes with very little rise. Let’s see what happens in another 10 minutes. The mandelbrot need to be baked at least 25 – 30 minutes. The interior is raw at 20 minutes. For a “soft” mandelbrot, bake 30 – 35 minutes. Let cool slightly, and slice about 1/2-inch thick. For a more traditional mandelbrot, let rest until cool enough to handle and carefully slice 1/2-inch thick using a serrated knife. Place slices on a baking sheet and return to 250 degree oven for 20 minutes, or until desired crispness. The overall flavor is good but the pomegranate taste is all but imperceptible. Thank you for the recipe for the honey cookies -sound yummy and can’t wait to make them. Hi Vicky, Not completely necessary, but it adds a flavor note that is similar to most honey cakes. If you’d like you can sub it out for triple sec, or another liquid. Dough was sticky. Should that be? Also wondering if you have suggestions for a substitute (non-alcohol) for whiskey and for instant espresso powder. Would regular instant coffee be okay? Plain water can be added as an alternative (or milk if you are making these for after a non-meat meal), and Instant coffee should work just fine. Yes, also both doughs are supposed to be quite sticky! Hi all! Those who commented were right-The dry ingredients are mixed, together, then added all at once after step five. Sorry about the confusion! Everyone’s oven is different, so it’s always a good idea to check your baked goods according to the recipe instructions, but then continue cook if you feel that it is not yet done, as you have done. Thanks for sharing your tips! I made this recipe for my Mah Jongg group and it was a winner. I will agree that the comments above by Felice Bogusand T. Penner are right on target. It was suggested to me that the cookie dough needs to be rolled into a ball, rolled into the plain confectioners sugar, flattened out a bit and place some of the almonds on top of the cookie on the sheet. A little more sprinkle of confectioners sugar would top it off! Also, 12 minutes at 350 degrees is not enough. It needs at least 15 minutes or maybe more. I made this recipe for my Mah Jongg group and it was a winner. I will agree that the comments above by Felice Bogus and T Pevner are right on target. It was suggested to me that the cookie dough needs to be rolled into a ball, rolle into the plain confectioners sugar, flattened out a bit and place some of the almonds on top of the cookie sheet. A little more sprinkle of confectioners sugar would top it off! Also, 12 minutes at 350 degrees is not enough. It needs at least 15 minutes or maybe more, depending on your oven. The combination of flavors is wonderful.